Creating a variety of Asian flavour dishes require much manpower, time and ingredients. 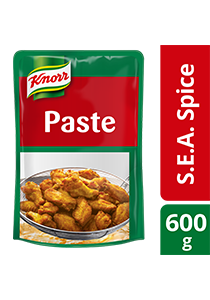 Knorr South East Asian Spice Paste lets you create the variety you need efficiently. All food addictives used are from plants and synthetic origin. May contain traces of cereal containing gluten, egg, milk, crustacean, fish, mustard and peanut. 1. Mix 100g Knorr South-East Asian Spice Paste with 100ml water to form a marinade. 2. Add in chicken parts and mix well. 3. Chill for least 4 hours. 4. Deep-fry marinated chicken until golden brown.